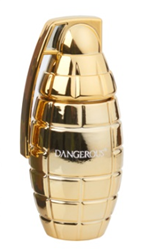 Explode on the scene with newest Dangerous GOLD GRENADE fragrance. This fragrance is one of three new fragrance launched in 2017. It comes in a traditional camouflage green box. The bottle is metallic gold. It’s an exciting fragrance with the bottle a great addition to any dresser.